Tyler is well-known for its world-famous Rose Garden, which bursts into bloom in late April and early May. But it’s also no secret that Tyler draws tens of thousands of visitors a month earlier to drive the historic Azalea District to see the fabulous azalea displays, along with other spring-blooming flowers. Azaleas have been part of the Tyler landscape for almost 100 years, but few realize that there is also a native azalea that grows along the sandy creeks in the woods surrounding Tyler. The Texas Azalea (Rhododendron oblongifolium) is a deciduous azalea with sticky white flowers that blooms in May – not so showy, but very cool none-the-less. Regardless of whether you live on the Azalea Trail or in the country, you too can enjoy these beautiful and colorful plants in your own yard. 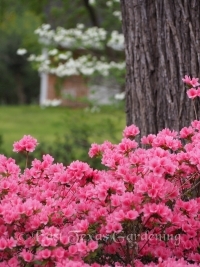 Azaleas thrive in East Texas due to the plentiful shade, (normally) frequent rainfall, and sandy, well-drained, acid soils, all of which combine to provide the right ingredients for growing these spring-blooming beauties. 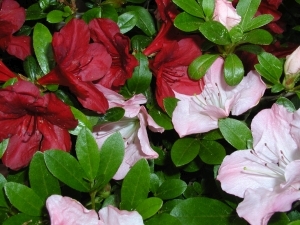 For more details on growing azaleas, see this article. Azaleas are a very diverse group of plants. They belong to the genus Rhododendron, but are quite different the rhodies so common “up north”. (True rhododendrons bred for southern conditions are now coming available – a topic for another article). 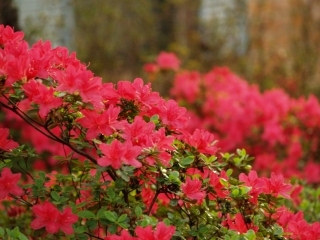 Azaleas are classified into several major hybrid groups based on their breeding. Their blooms may be single or double, and flowers range widely in both color and size. Azaleas have different growth habits from compact to large shrubs, with leaves ranging from small to large. Their blooming season varies from early March to late spring and early summer, and many varieties repeat bloom in the fall. Some of the most common hybrid variety groups include Kurume, Southern Indica, Glendale, Robin Hill, Rutherford, Satsuki and Encore. Within each group there may be dozens of different varieties to choose from. There are also several azaleas native to the United States that perform spectacularly well in our area. Many of the varieties which bloom early during the Tyler Azalea Trail are of the Kurume and Southern Indica types. Popular Kurume azaleas include 'Hinodegiri' (red), 'Hino Crimson', 'Coral Bells' (pink), 'Snow' (white), 'Flame' (orange red), 'Hershey's Red' (bright red). These evergreen plants typically are of smaller stature, growing from about 3 to 6 feet tall, with dense foliage and a twiggy branch structure. They have a moderate growth rate. Since Kurume varieties bloom before new growth begins, and the plant is usually completely covered with blooms, they are among the showiest of the azaleas. Their smaller stature also makes them very useful for designing landscapes where smaller sized shrubs are needed. Southern Indica varieties tend to be larger (from 6 to 12 feet tall), with larger leaves and large, showy, 2 to 3 inch flowers. Common varieties include 'Formosa' (rose purple), 'Fielders White', 'George L. Taber' (light pink), 'Judge Solomon' (pink), 'Mrs. 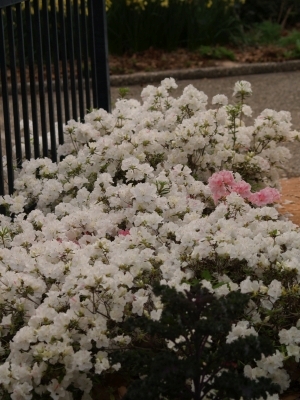 G. G. Gerbing' (white), and ‘Pride of Mobile' (deep rose pink). A group with similar characteristics to Southern Indica is the Glenn Dale Hybrids, bred to have greater cold hardiness. 'Fashion' (rose with dark blotch) and 'Glacier' (white) are two popular varieties grown in our area. 'Fashion' also has attractive purple-bronze foliage in winter and early spring, giving it a 2-season usefulness. There are many more azalea varieties in this group. Gumpo azaleas are a very dwarf group of plants with tiny leaves and a tight, low growth habit. They bloom much later, typically in May, and the very large pink or white blooms are often partly hidden in the new growth. They make nice landscape plants where compact dwarf plants are needed. Satsuki is a Japanese word which means "5th month" and most Satsuki types bloom in May and into June, greatly extending the azalea blooming season. They are generally low growing, from 2 to 4 feet tall, with a similar spread. Bloom color can vary greatly; some varieties can have blooms with streaks or blotches of white or other colors. Some varieties include 'Amaghasa' (deep pink), 'Higasa' (deep rose pink), and ‘Wakaebisu’ (pink). There are many other hybrid groups, many with just one or a few popular varieties commonly grown. 'Sunglow' (deep rose pink or purple red) is a pretty Carla hybrid, as is the very similar 'Adelaide Pope'. Girard hybrids 'Hot Shot' and 'Rose' are mid- to late-season blooming. 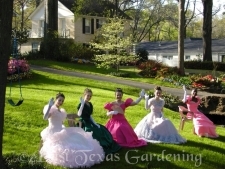 'Red Ruffles' and 'Pink Ruffles' - two popular varieties in Tyler - belong to two different groups. The Robin Hill hybrid group includes several mid- to late-blooming varieties including 'Watchet' (light pink) – a favorite of mine, 'Nancy of Robinhill' (pink), 'Conversation Piece' (pink with sectors and blotches of darker pink on some flowers). ‘Delaware Valley White’ is of unknown hybrid origin, but is a popular white due to its characteristic of cleaning shedding its spent flowers. ‘Snow’ is another popular white variety whose faded brown blossoms tend to hang on for some time after bloom is over, resulting in a less tidy appearance. In the past 15 years has seen the development of a new group of azaleas with the pronounced habit of blooming more than once per year. Almost 20 years ago the first Encore varieties were introduced, bred by breeder Buddy Lee of Independence, Louisiana. Today there are 27 varieties of Encore azaleas, all which include in their name “Autumn” which highlights the fact that they bloom multiple times per year, including in the fall of the year. Joining the Encore group with reblooming habits are other newcomer groups, including Bloom-A-Thon and Deja Bloom azaleas. All of the azaleas previously mentioned are evergreen varieties, holding their leaves for more than one year. Many of them have attractive fall foliage colors, with yellow and rusty orange being common, depending on variety. As I mentioned earlier, the native Texas Azalea (R. oblongifolium) is a deciduous shrub. They have a very different growth habit than the evergreen types, upright and not as dense. There are several other American native deciduous azaleas (16 species), many with extremely showy and very fragrant flowers. The Piedmont or Honeysuckle azalea (R. canescens) has attractive, fragrant, pink or white blooms in early spring before leaves emerge. 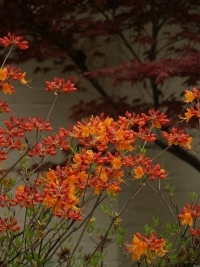 The Florida Flame azalea (R. austrinum) has a wide range of colors including yellow, orange and red. There are stunning hybrids of various deciduous azaleas species, all with striking colors not normally seen in the evergreen azaleas. The Aromi hybrids, Dodd’s Confederate series, and the new Southern Living introductions were all bred in the south, with large trusses of colorful, fragrant tubular flowers. 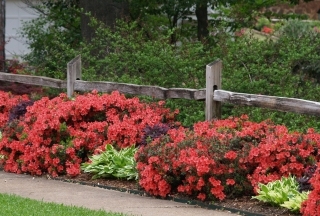 With proper selection, you can have a continuous display of azaleas blooming from mid March through May or early June. 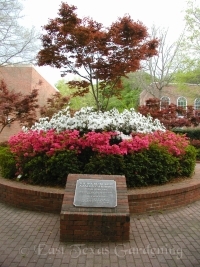 A great place to view many of the Encore varieties is in the Ina Brundrett Azalea Garden, located on the Tyler Jr. College Campus just east of Jenkins Hall, near the “duck pond”. Azalea blooming season is usually classified in general terms as early, mid or late. 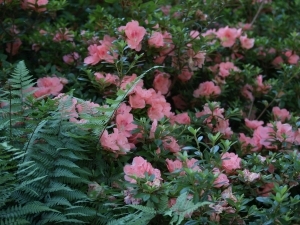 The Tyler Azalea Trail is based mainly upon early blooming varieties. Watch out for clashing colors. Some colors are not complimentary and if planted together, can detract from each other. The color of the blooms should also compliment the colors of the house. Take time to develop a landscape plan before buying. Your selections should enhance the beauty of the yard, not distract from it or become a maintenance chore. Pay attention to the ultimate size of the plants. Don't let those "cute little plants" fool you! They may quickly grow into full, large plants, overtaking smaller growing nearby plants if you neglect to consider the ultimate size of each variety.